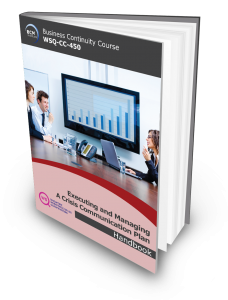 This 2-Day course is a follow-up course to the CC-350 Implementing Crisis Communication Plan course. Participants are required to have attended and completed the CC-350 Implementing Crisis Communication Plan before attending the CC-450 Executing and Managing Crisis Communication Plan course. It is designed for emergency and incident management, crisis management and/or business continuity management team members who would like to have a more in-depth knowledge on how to execute the Crisis Communication that they have helped formulate in the earlier course. The workshop would allow participants to have the competency to form a crisis communications team, implement action steps prior to crisis communication message delivery either internally or externally, and also have the ability to assist in the implementation of action steps to deliver key messages to the public, communicating and advocating business continuity strategies and plans to stakeholders. The course would also help them to ensure proper record keeping of communications. At the end of the 2-Day course, Singaporean and Singapore PR participants who are taking advantage of the Workforce Skills Qualifications (WSQ) funding, would need to attempt and pass the 2 hours interview and written assessment. Passing the WSQ assessment allows them to obtain 1 Statement of Attainment certificate awarded by WSQ. Completion of the 2-Day course also allows participants to achieve an internationally recognised Crisis Communication certification, .i.e. the Crisis Communication Certified Specialist (CCCS)* certificate. NOTE: This course does not aim to equip a participant with the tools and competency to handle press conferences and press releases nor would it provide participants with an in-depth understanding of body posture or language used during such instances. * To achieve the CCCS certification, participants would need to attempt the Qualifying CCCS examination and make payment of SGD200 as part of the Qualifying examination fees. CC Certified Specialist (CCCS) Certification is awarded to participants who successfully completed the 2 Day CC-450 Executing and Managing Crisis Communication Plan course, a passed the Qualifying CCCS examination, sends in an application detailing at least 1 years of CC experience, make the application processing fee payment of SGD75 and satisfies and meets the experience requirements of the independent certification body. To train participants who do not have a crisis communication background and are in the emergency and incident management, crisis management and/or business continuity management team, to have the competency to execute a crisis communication management plan for their organisation. There is no examination attached to the course but a WSQ Competency Assessment needs to be attempted and passed in order for Singaporean and Singapore PR to obtain his/her WSQ Statement of Attainment (SOA). Examinations are only applicable if participants opt to attempt the Qualifying CCCS examination at SGD200. The CCCS Examinations is a 2.5 hours, 100 online Multiple Choice Questions done in an invigilated room either at BCM Institute’s designated exam venue. All course fees include courseware and 2 tea breaks. SGD75, applicable only for participants who attempted and passed the Qualifying CCCS examination and fulfil the CCCS certification requirements of having a minimum of 1 year of Crisis Communication experience. SGD200 for the Qualifying CCCS examination fee. 1 For more information on funding, please visit www.skillsconnect.gov.sg for eligibility details and WSQ application.